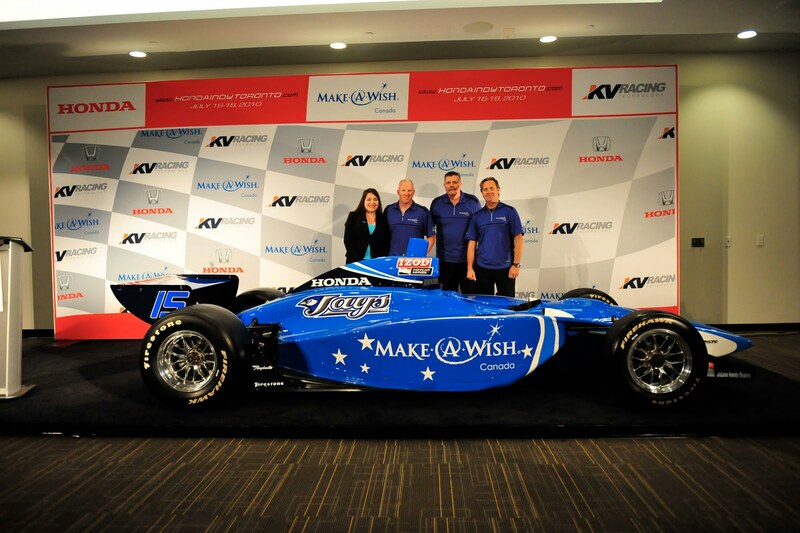 Presented in Toronto on Tuesday, Paul Tracy's car will a collage of sponsorship heavily featuring Make-A-Wish Canada. Honda Canada and the Toronto Blue Jays will also be recognized on the blue and white KV Racing Technology race car as he competes in July for the Honda Indy of Toronto. Coming only a few short days following Paul Tracy's missed opportunity to make the Indy 500 field, the 41 year old Canadian open wheel star flew from Indianapolis stinging with disappointment for recent on-track appearance. "After leaving here (Indianapolis Motor Speedway) on Sunday with our tail between our legs and waking up in Toronto and still not feeling very good with how the weekend went, we were there to make an announcement about racing in Canada." Upon landing in Toronto, the press conference would bring a change in attitude to the driver. "Jimmy (Vasser) and I both got up in the morning and had breakfast." Tracy said. "We were both still crying in our cereal bowl about how Sunday went. When we got to the venue where the car was, there were a half-dozen kids there. Your heart just sank. You think you've got troubles, and you've got kids there that are sick. It kind of put things in perspective that life's not so bad for me because I didn't qualify for the Indy 500." The partnership between Paul Tracy, KV Racing Technology, and Honda Canada carries on from last year where his #15 car was spotlighted tangling with Penske Racing's Helio Castroneves through turn 3. Representing the Canadian Wounded Warriors cause, Make-A-Wish is the supported charity in 2010. With no offense to FAZZT Race Team full-time driver Alex Tagliani, Tracy is likely to serve as the irrefutable hometown hero of the 2010 IZOD IndyCar visit for this Canadian round. Tracy has won twice in 1993 and 2003 on the streets of Toronto garnering an overwhelmingly positive fan reaction. Winning in Toronto as well as at the now defunct Molson Indy round in Vancouver, Paul Tracy is also the only Canadian to win an CART and/or IndyCar Series event.